This competition is open to Republic of Ireland residents who are aged between 12 and 18years who are attending Second Level Schools, Youthreach Centres or Youth Clubs. Other entries will not be considered. You must provide Graduate.ie with your name, e-mail address and school name and address. 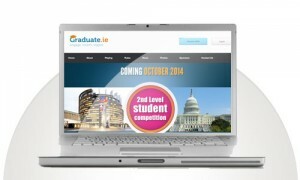 Graduate.ie will only ever use your personal details for the purposes of administering this competition, and will not publish them or provide them to anyone without your permission. The Webmaster’s decision is final in every situation including any not covered above and no correspondence will be entered into. New quizzes are posted each Monday during ‘term’ times. Winners will be contacted personally by email using the address supplied. In the event of a tie the winning entry will be drawn at random. The prize must be taken as stated and cannot be deferred. There will be no alternatives. Entry is by Internet only. Graduate.ie does not accept any responsibility for late or lost entries due to the Internet. Proof of sending is not proof of receipt. Graduate.ie cannot accept responsibility for broken links to websites containing answers to the quiz or any factual or other errors in the questions or answers provided. Graduate.ie does not endorse these sites or authenticate the information that they contain. Entrants must supply full details as required above, and comply with all rules to be eligible for the prize(s). No responsibility is accepted for ineligible entries or entries made fraudulently. This competition is not open to employees or contractors of Graduate.ie, any person directly or indirectly involved in Graduate.ie or the running of the competition, or their direct family members. Graduate.ie reserves the right to cancel this competition at any stage, if deemed necessary in its opinion, and if circumstances arise outside of its control. Prizes unclaimed after 28 days will be deemed to have been forfeited and Graduate.ie reserves the right to either offer the prize to the entrant whose name is next drawn at random, or to re-offer the prize in any future competition on Graduate.ie. These rules are governed by the laws of the Republic of Ireland.